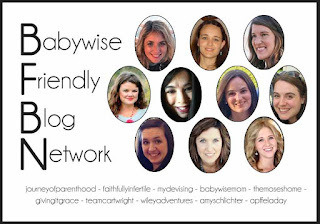 It's BFBN Guest Post Day and today I'm really excited about this guest post from Emily at The Journey of Parenthood. 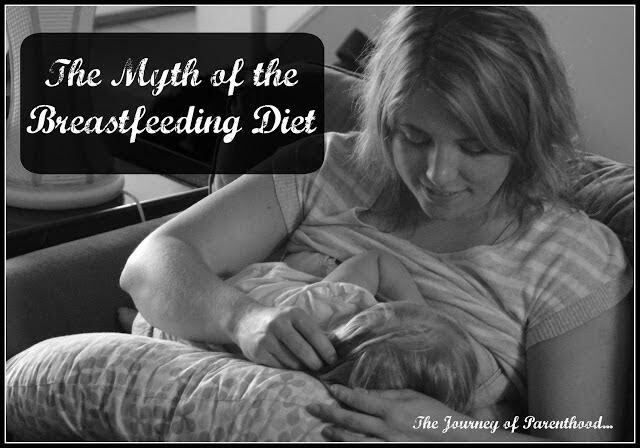 Below Emily shares about the myth that all women loose weight while breastfeeding. I couldn't wait to read this post, as I am currently breastfeeding my 5 month old and my body has clearly and un-apologetically decided it's done shedding weight for the time being. You might remember at the time of the last guest post, I shared that I wasn't really a fan of the breastfeeding experience but that I do it because I am able to. Well - the Lord has really changed my heart about that! Over the past two months I've grown to cherish breastfeeding my baby, and plan to continue doing so past my original goal of 6 months. That means, however, that I will be wearing my postpartum "transition" clothes a bit longer than I had planned. So Emily's post is very timely for me right now. Our bodies are meant to be used, not preserved. So to that end, I'm using mine to sustain my baby - and embracing this squishy season before it's gone too fast. If you like Emily's post below, be sure to also check out her recent post about losing the baby weight once you're done breastfeeding. Preparing to nurse for the first time? These are my favorite nursing products. And PS: today I'm sharing over at Team Cartwright about what goals to focus when bringing baby home. It is awesome to see how well supported breastfeeding mothers our in society today! Women nurse in public with less shame and more support. Women pump during office hours and aren't hassled as often about the time away from their desks. Breastfeeding is becoming more and more common (According to the CDC, 45% of all mothers in 2008 were still breastfeeding at 6 months). It's wonderful that breastfeeding mothers are getting more support. Breastfeeding is not easy. 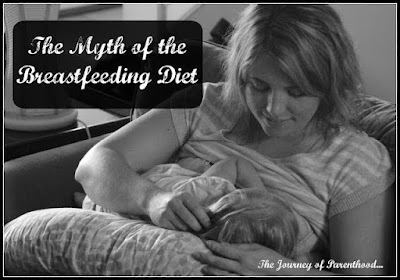 Let's be real, even if you formula feed motherhood is not easy! Being a new mom is scary. There is so much pressure. You have this little baby in your arms that completely and fully relies on YOU for everything. 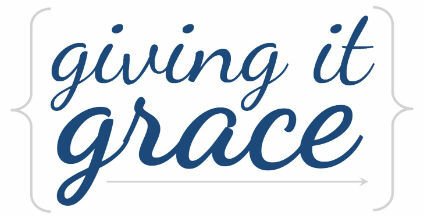 It's all so new and it's such huge adjustment that literally affects every aspect of your life. How about we quit adding extra pressure to new moms? I can't even count the number of times as a new mom that I heard "Breastfeeding is awesome! It'll make the baby weight just fall off!" I'm not saying people don't mean well. I know it's a common thing that is said by people as well as published in our media outlets. Breastfeeding = Natures Best Diet Plan. The Subcommittee on Nutrition During Lactation reports "On average, lactating women who eat to appetite lose weight at the rate of 0.6 to 0.8 kg (1.3 to 1.6 pounds) per month in the first 4 to 6 months, but there is a wide variation in the weight loss experience of lactating women (some women gain weight during lactation). Those who continue breastfeeding beyond 4 to 6 months ordinarily continue to lose weight, but at a slower rate than during the first 4 to 6 months." 1. "lactating women who eat to appetite" - Is that majority of lactating women? Because I know personally I tend to eat more while I'm nursing. I get cravings that are almost worse than pregnancy ones and you know none of them are for healthy things like salad. The secret to staying awake for those middle of the night nursing sessions? Cosmic Brownies. So let's be real, a lot of nursing moms are eating "above appetite. 2. "lose weight at the rate of 1.3 - 1.6 lbs per month in the first 4-5 months" - I'm not trying to speak for everyone but I know I had a LOT more weight to lose than just a couple pounds after I gave birth to my babies. And losing 1-2 lbs per month sure as heck isn't "the weight falling off" either! 3. "there is a wide variation in the weight loss experience of lactating women" - So sure. Some women may lose more than that average 1-2 lbs per month. Some. 4. "some women gain weight during lactation" - There is the kicker! Guys. Not everyone has the weight "fall off" and not everyone even loses weight at all while nursing. Some people, they gain weight during the time they are breastfeeding. 5. "those who continue breastfeeding beyond 4-6 months ordinarily continue to lose weight, but at a slower rate than during the first 4-6 months" - I nursed my last baby for 13 ½ months. IF I had followed the average weight loss for a nursing mom then I "should have" lost maybe 15 lbs. Which isn't bad but losing 15 lbs over a 13 ½ month span of time is FAR from the weight "falling off" due to breastfeeding. Breastfeeding is an amazing way to feed our babies. It's best for them, and an incredible experience for us as their mothers. The bond created during breastfeeding is something that nothing else can come close to comparing to. There are endless benefits to breastfeeding that benefit both mommy and baby. However, weight loss shouldn't be focused on so much in our culture. So often the "breastfeeding diet" is listed as one of the top motivations to breastfeed. Telling new moms that they will have their baby weight just disappear is unfair. It puts added pressure on a woman who already feels so much pressure. Let her enjoy the postpartum period. Let her figure out her path as a new mom. Let her accept that her body won't ever be the same and that that's okay. One day she will stop nursing that baby and when she does she can then figure out the best path to lose that baby weight. For me personally, my body holds weight while nursing. I've come to learn that many women are like me! The more babies I have (I have 3) and the older I get (I'm now 31) and the longer I nurse (each baby I nurse longer than the one before) the more weight I hold onto and the more I struggle with losing it while breastfeeding. Every time I get pregnant I tell myself I'm not going to get wrapped up in the pressure of trying to lose the weight while I'm nursing but every time I find myself right back there. Looking in the mirror and hating what I see. Lacking the confidence I usually have. Feeling just straight icky about myself. When what I should be doing is enjoying my new baby. Savoring those nursing cuddles. And not letting the "breastfeeding diet" make me stress over what the scale says. If you meet a new mom and find out she's breastfeeding please build her up. Give her words of encouragement. Remind her she's doing a great thing. And maybe even add a compliment in there about how great she looks. Because motherhood is beautiful and a few (or 10 or 20) extra pounds while breastfeeding our babies doesn't make us any less beautiful.